Was Kaido from Chuo or from Meiji University? That's a very interesting question, indeed. (Laughing...) I'll check why I put him with Chuo. Edit: Definitely Chuo University. The kesho-mawashi was sponsored by Nakano High School, a Tokyo-area school affiliated to Meiji University, but Kaido did not stay in the Meiji system for his university education. Updated for Hatsu 2013 with Shohozan's promotion to sanyaku and Azumaryu's juryo debut, the first out of Kyushu Joho..
Late Hatsu updates for the retirements of Takamisakari and Bushuyama, and updated for Haru 2013 with the Sotairyu and Oiwato (né Kanbayashi) makuuchi debuts. And the links have been changed to sumodb.sumogames.de now, so clicking on them will actually do something again. Updated with Miyabiyama's Haru retirement, and the Natsu makuuchi debuts of Homarefuji/Azumaryu/Daikiho and juryo debut of Kizenryu. Updated for Nagoya with the makuuchi debut of Tokushoryu and the juryo ascent of Endo. thanks for all the work you put into making this list and keeping it up to date..
Belated Aki update for Endo's makuuchi debut. Kyushu update with Higonojo's juryo debut. Updated for Natsu with Yoshikaze's sanyaku debut, and also Kimurayama's intai (from Hatsu) that wasn't reflected yet. Incidentally, Aki basho is the 5th tournament in a row without any new sekitori from a collegiate background. That hasn't happened since 2006/07 (6-basho gap) and it's only the second time in the last 20 years. Thanks for that Asashosakari seki. As I graduate I follow these men closely- especially the Nittai dai boys who come and let us train with them when they visit Sydney as well as Nichidai who seem to have a stronghold when getting selected for the World Championships . One day I hope to get around to making a similar table with all the rikishi who have competed at the amateur Sumo World Championships. Katrina has a list up until a certain date so I will work backwards until she can find it. I counted about 20 that have won individual Gold medals but I need to dig out all the results to take into account rikishi who won Silver or Bronze like Endo or those that also got medals in the team events like Ichinojo. I also want to include any that just competed and didn't win medals. There are quite a few juniors who have done well like Osunaarashi or Takanoyama who got bronze as a junior in 2000 along with Minaminoshima. The 2004 Junior worlds was a rich harvest for the stables with Kaisei,Tochinoshin , Tochiozan and Goedo all competing against each other.There wasn't much non-Japanese recruitment after that. Natsu will be the 10th straight basho without any collegiate makuuchi debut, the longest gap since the late 80s (1987.05-1989.05, 13 basho). The new banzuke topics add another interesting fact - Natsu is also the first time in over 20 years (since Hatsu 1995) that the collegiate rikishi in makuuchi number only 8. Updated for Nagoya with a bunch of debuts - Takarafuji in sanyaku (first one from Kinki in 35 years), Hidenoumi in makuuchi, and Mitakeumi and Takaryu in juryo. Early Aki update with Shodai, new sekitori out of Tokyo Nogyo after six years. Quite a turnaround from a couple of years ago, when the collegiate presence in makuuchi looked a bit moribund. Mitoryu is the fourth foreign rikishi to reach the sekitori ranks after attending university, following Ryudo, Tokitenku and Azumaryu. Natsu 2018: sanyaku debut for Endo (second for Oitekaze-beya to reach the titled ranks), juryo debut for Wakatakakage (Toyo / Arashio; first collegiate sekitori for Arashio-beya, so a new heya entry), and intai for former one-time maegashira Oiwato and for former three-time juryo Masakaze. Nagoya 2018: a pair of juryo debuts for Chiyonoumi (Nihon Taiiku / Kokonoe) and Churanoumi (Nihon / Kise). 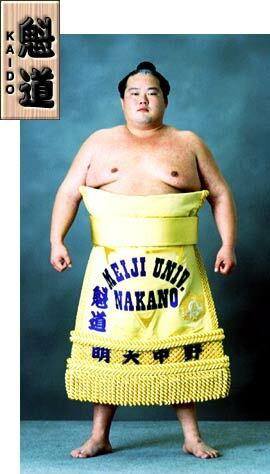 No further updates for Aki basho.